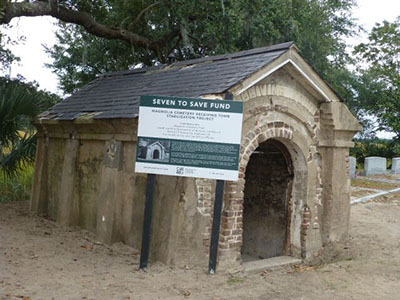 Seven to Save is an outreach program designed to preserve vulnerable historic and cultural resources in the Charleston area through education and public awareness. Because each project poses unique challenges, we work toward creative solutions tailored to the specific issues at hand, often leading to collaboration with partners in the community. When a project reaches a successful outcome, it is rolled off the list, and a new at-risk resource is added. 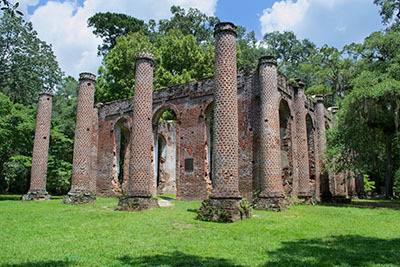 Located in northern Beaufort County and formerly known as Prince William's Parish Church, this ruin has been at the center of much of the region's turbulent history. Originally constructed from 1745 to 1753, the church held its first service in 1757. British troops razed the edifice during the Revolutionary War, but it was rebuilt on the same foundation in 1825. During the Civil War, the church again succumbed to fire and has endured as a ruin ever since. While the site and surrounds have remained intact, the use of the site has intensified greatly because of the active promotion of Sheldon as one of the top sites to visit in Beaufort County. The wear and tear from tourists visiting the site, and sometimes leaving their mark or taking a souvenir, has left the ruin in a precarious state. 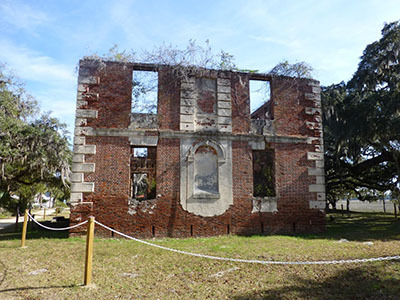 Located on Edisto Island, the ruin is one of South Carolina’s most important links to its French Huguenot heritage and one of the few surviving examples of a brick colonial plantation house. It requires immediate stabilization and the development of a long-term use / preservation plan. Constructed in 1856, the Francis P. Seignious House at 73 Cannon Street has been the home of the United Order of Tents for more than 50 years. The United Order of Tents is an all-female benevolent society that was founded as an Underground Railroad for slaves escaping from the south. Today, the building needs immediate stabilization and development of a preservation plan. 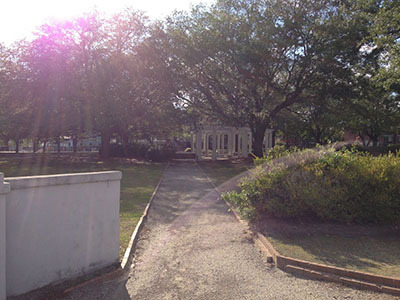 At the core of Charleston’s only neighborhood planned as a traditional English town model, Hampstead Square was the historical gathering place in the Eastside community for African-American political rallies in the 19th century and for provisional shelters following the 1886 earthquake. A beautification and revitalization plan would help restore the square’s openness and symmetry to make the site a community gathering place once again. In a city with as many historic buildings as Charleston, the neighborhoods of the middle and upper peninsula that date from the more recent past are often overlooked. 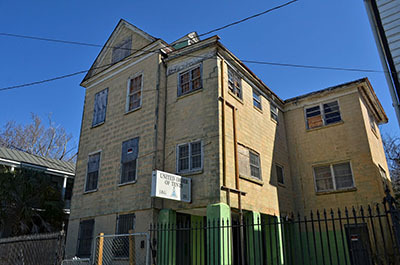 Such is the case with Ward 11, developed in the early-20th century and bounded by the Septima Clark Expressway to the south, Mount Pleasant Street to the north, King Street to the east and Rutledge Avenue to the west. 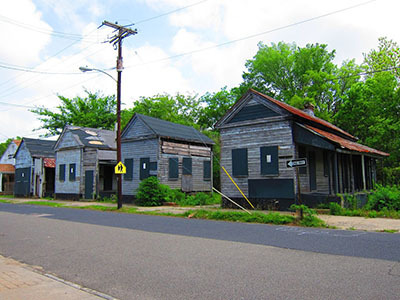 The largely undocumented area does not have full protection from the Board of Architectural Review and faces increasing development pressures, demolition by neglect, and insensitive infill. 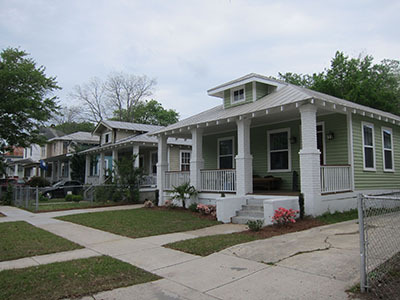 An important vernacular building type in Charleston, the “single cottage” form is being lost throughout the city by demolition and inappropriate alterations that erode character-defining features. The cemeteries in this district have become increasingly fragile since its nomination to the National Register of Historic Places in 2004. A large number of people care about and have a deep connection with these historic cemeteries, but their caretakers are overwhelmed by the maintenance and preservation tasks associated with them. Mobilizing stakeholders to care for these sacred places is a top priority.